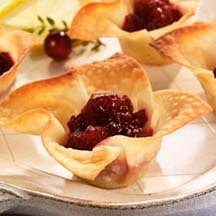 Easy, delicious and elegant, entertaining with flair and good taste is simple when you serve these delightful appetizers. Preheat oven to 350°F (175°C). Spray 24 miniature-muffin cups with nonstick cooking spray. Combine sugar and water in a medium saucepan; bring to a boil. Add cranberries; return to a boil. Reduce heat; simmer about 3 to 4 minutes or until cranberries pop and mixture thickens slightly, stirring occasionally. Remove from heat; stir in lemon juice and peel. Press 1 wonton wrapper gently into each muffin cup, allowing ends to extend above. Spray edges of wonton wrappers with nonstick cooking spray. Bake for 12 to 14 minutes or until bottoms of cups are beginning to brown. Place 1 cube of Brie in each cup; place sheet of aluminum foil over each pan to prevent excessive browning. Bake 3 to 5 minutes or until Brie is soft. Remove from oven; top each with about 1 teaspoon cranberry mixture.